All transactions are safe and secure with a reliable history in online purchasing behind each of our associates. 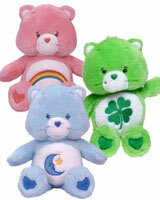 Buy the Care Bears Plush Stuffed Animals to own Care Bears clothing and merchandise. Cuddle up with your favorite rainbow sliding furry friends. Care Bears stuffed animals include characters like the Bedtime Bear plush, Cheer, Oopsy, Birthday, Funshine and many more. Soft and huggable, these plush toys will snuggle their way into your child's heart and even your own. Pair them with a t-shirt from the gallery for the ideal gift. In addition to the Care Bears Plush Stuffed Animals above, browse the Care Bears Clothing Gallery for more apparel like men's and women's clothes, kids shirts or hoodies.